Luffing jib tower crane the right fit for Smith Bros. & Wilson for challenging downtown project New construction projects always come with a set of challenges, but the site and lifting needs are usually straight forward enough that several different crane options fit the requirements. Building reconstruction, on the other hand, typically comes with its own unique challenges. Often, there are obstacles in the way that make selecting the right crane much more difficult, and bidding the right crane can be the difference between getting the job and moving on to the next opportunity. To further reduce project costs, SBW’s plan for the CTL 430-24 crane included a freestanding tower that wasn’t tied into the library’s structure. Originally, SBW planned on using an undercarriage strut mounting for the tower section. However, the optional base’s availability was limited and not available in western Canada. 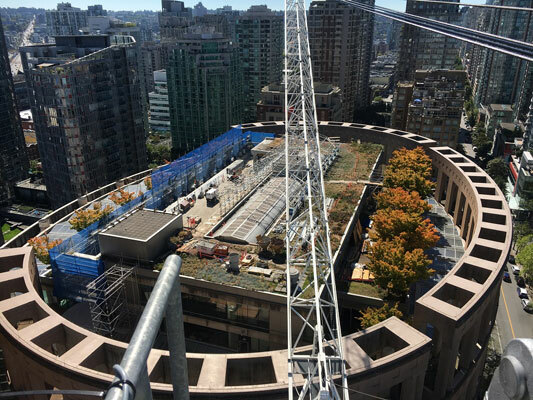 SBW put its century-plus concrete fabrication experience to work and consulted with engineering firm, TNAI Engineering Ltd. of Vancouver, to construct a custom concrete base to serve as a tying point for the crane’s tower. TNAI came up with an ingenious way to anchor the crane in a manner that would not require it to be secured directly into the building’s foundation.